The Private Life of Henry VIII (1933). 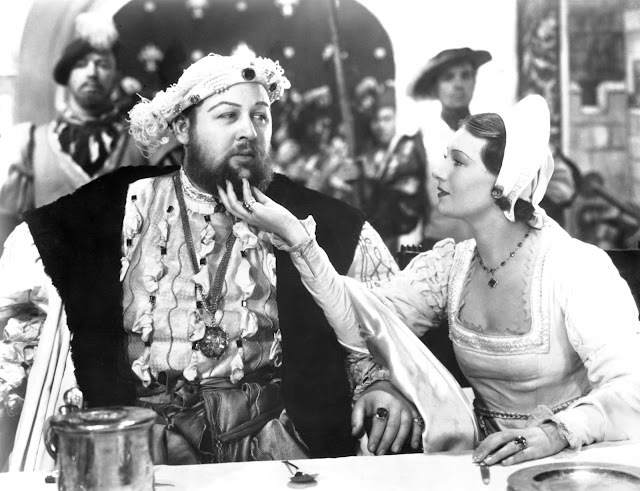 "The Private Life of Henry VIII" (1933), directed by Alexander Korda from a script by Lajos Biró and Arthur Wimperis, was a true breakthrough role for Charles Laughton, one of the great acting talents of the 20th Century. If you ever wondered where the stereotypical portrayal of Henry VIII as a gluttonous cad who throws his chicken bones over his shoulder, look no further. A great film that will stay with you afterwards. Those soldiers behind the King better get ready to duck in "The Private Life of Henry VIII (1933)"! Charles Laughton was at his best when playing commanding, dictatorial types such as Captain Bligh, the father in "The Barretts of Wimpole Street" and the Barrister in "Witness for the Prosecution." 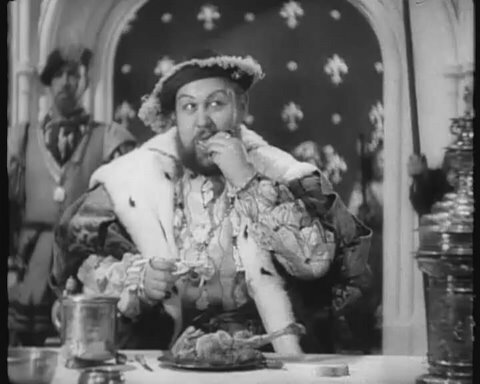 In "The Private Life of Henry VIII," Laughton gives perhaps his best performance as English King Henry VIII, establishing and reinforcing clichés about the King that remain with us today. "The Private Life of Henry VIII" portrays the king as being, throughout his life, part boy, part tyrant, part buffoon. The real-life king certainly was a colorful sort, and Laughton hams it up unmercifully at every opportunity. There also are several other actors around who also are perfectly capable of stealing scenes, which raises the camp value of the film considerably. But first, Laughton. He goes the whole nine yards with this portrayal in "The Private Life of Henry VIII," throwing chicken bones over his shoulder after eating, sneaking around the palace for late-night trysts like a schoolboy, flirting with all the attractive ladies at court. In fact, toward the end, he looks out the window to find a new wife, and some young schoolgirls run by, and the horrified thought runs through one's head that maybe he will choose one of them.... But we are at least spared that travesty, as he chooses a woman to whom they are running. But the way Laughton plays Henry, anything is possible. Laughton well deserved his Oscar for this role. Interestingly, when he played Henry VIII again twenty years later in "Young Bess," he played him more as a tyrant and less as a buffoon, and thus not nearly as enjoyably. 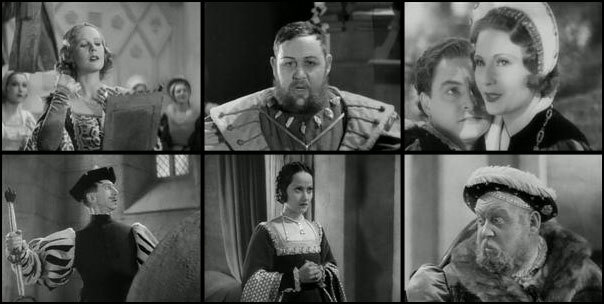 Scenes from "The Private Life of Henry VIII" (1933). To me, the other standout performances are Elsa Lanchester as Anne of Cleves and Binnie Barnes as Katherine Howard. Henry flirts with Katherine throughout the movie, and Binnie Barnes plays Katherine as a scheming 1930s-style temptress. Elsa Lanchester gives the most memorable performance in "The Private Life of Henry VIII," though, as the idiosyncratic foreign bride who (fortunately for her in the long run) doesn't work out at all. She stumbles, she speaks with a weird accent, she beats the King at cards and demands immediate payment in cash - it's quite a performance. And, portrayed as the most homely of the women around the King, she perversely stands out and becomes memorable for that reason. Binnie Barnes putting the moves on the King in The Private Life of Henry VIII (1933). So, there are fine performances in "The Private Life of Henry VIII." But the film is marred by being uneven and lacking clarity in places. Cromwell is barely noticeable, even though he had a huge hand in the King's "private life." The fate of each wife is not made particularly clear, they weren't all beheaded, you know. The King seems to age at a very uneven rate at the end, as if the filmmakers were in a hurry to get the film over with. And the character of Thomas Culpepper, played by Robert Donat, is much, much too serious for what essentially is a comedy centered around the King, though taken individually, his trysting scenes with Binnie Barnes are quite enjoyable. 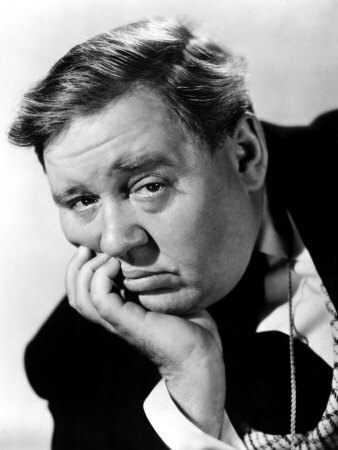 Cheer up, Charles Laughton, you won Best Actor for "The Private Life of Henry VIII"! 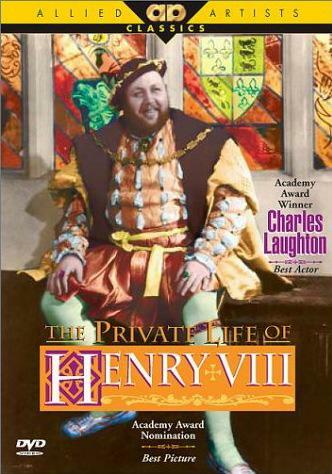 And I do view "The Private Life of Henry VIII" as a comedy, a historical comedy if you will. Laughton's and Lanchester's hammy performances ensure it. The King stripping down to his underwear to wrestle in front of the entire court - pure ham! It is the element of humor, in fact, which makes the film still watchable. A fine way to spend a couple of hours and learn just a little bit about history at the same time.